Looking for a hands-on approach to lifting spirits and building good will? Want to attract crowds and leave a lasting impression at your event? 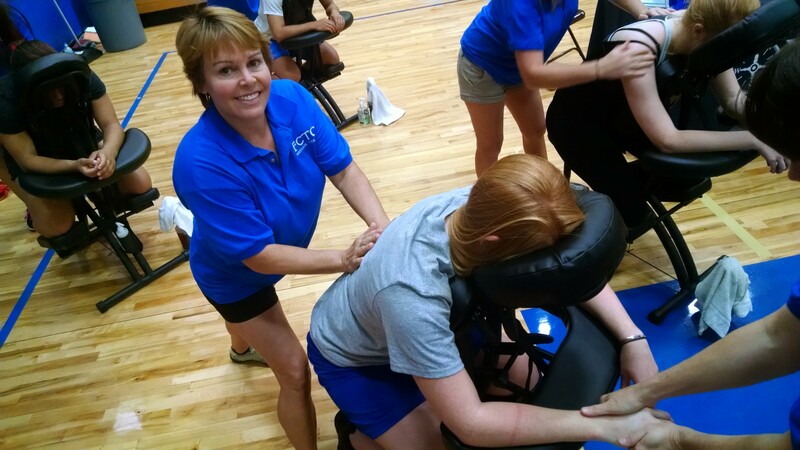 Chair Massages are a guaranteed way to bring a positive atmosphere to any Massage Event or Corporate Wellness Program. Massage Therapy has been shown to help work-related issues such as poor posture, carpal tunnel symptoms, and increase low employee morale. Many companies and individuals have problems finding economical ways to show their employees, clients, and anyone that's important, how much they value their relationship. Let Fit2go4it bring Chair Massage to your location of choice and watch how much they can influence your Event. Chair massage is done over clothes; while you are seated in a special chair that supports your head, and lets your back and neck completely relax. Most relaxation and many therapeutic techniques can be done in this position. No oil or lotion may be needed (some may be used on hands or bare arms). 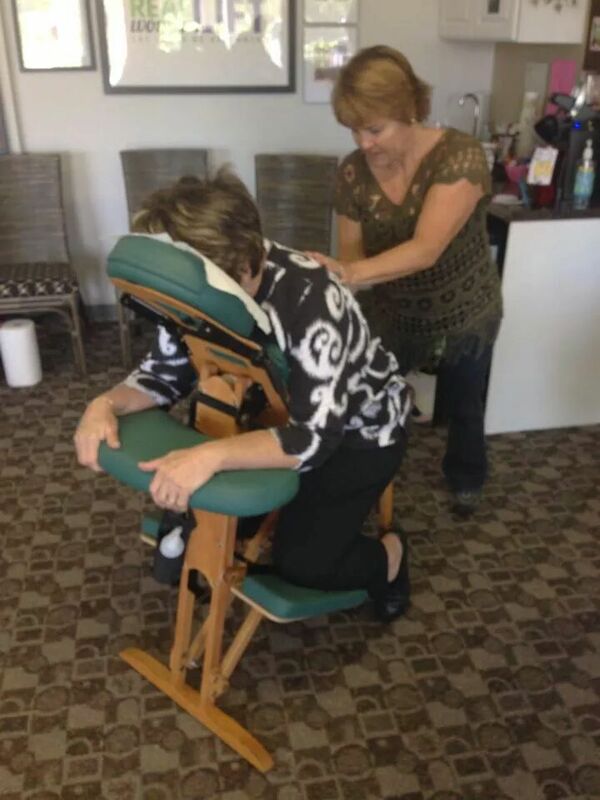 Health Fair Massages, Corporate Massage Programs, Marketing Events, Convention Massages, Mobile Massage Events - anywhere you can incorporate Chair Massage –Fit2Go4It can help! Corporate massage pricing is agreed upon application. All you need to do is make sure you have space for the therapist to set up the massage table and be able to work around it (about 6’ to 7’ in length and 4’ in width). I will bring all the supplies needed, including massage oil and/or lotion (if you require one or the other please let us know in advance), sheets and towels. If you would like to make a special request please inform the therapist ahead of time. Once the therapist has prepared the table for you, she will allow you the privacy to disrobe to your comfort level and position yourself on the table underneath a sheet. Therapists use professional draping techniques, so your privacy will be respected at all times. Is it necessary to remove any clothing for a table massage? No. Table massage is typically performed on a fully disrobed client, but it is entirely up to you. Some clients are only comfortable wearing shorts or undergarments. If you feel comfortable being disrobed during the massage, the massage therapist will keep all areas of the body that are not being worked on covered the entire massage. Private areas will always remain covered and will NOT be massaged. We would like to add that the massage has a better therapeutic quality if the client is disrobed, and many clients that are initially squeamish about disrobing eventually learn to trust the massage therapist. If the client would prefer to remain fully clothed, a chair massage may be an ideal alternative. One day. Fit2Go4It can accommodate appointments in as little as 2 hours, however, whenever possible I prefer as much advance notice as possible. Are there contraindications for massage? Yes, Medical contraindications include but are not limited to: uncontrolled hypertension, uncontrolled diabetes, fractures, herniated discs, malignancy, numbness or tingling in any part of the body, especially the hands and feet. Please inform the therapist on the intake form of any acute or ongoing health conditions before the massage. Has Vickie given you a massage?